Are you hoping to make your website or app trauma-informed? Terrific! Following are some resources to help you. Production of these materials was made possible through the North Carolina Coalition Against Domestic Violence (NCCADV) and Aquent's Design for Good Grant. You can find more details here about the trauma-informed project. If you have questions about any of the following items, please contact me to get the help you need. NCCADV webinar recording (please forgive the technical difficulties). It's available to all but you do need to provide your name and email. Please use and/or share any of the following items with others. Slides from my talk "What Would A Trauma-Informed Website Look Like?" The webinar on August 11 will be on NCCADV's webinar page soon. 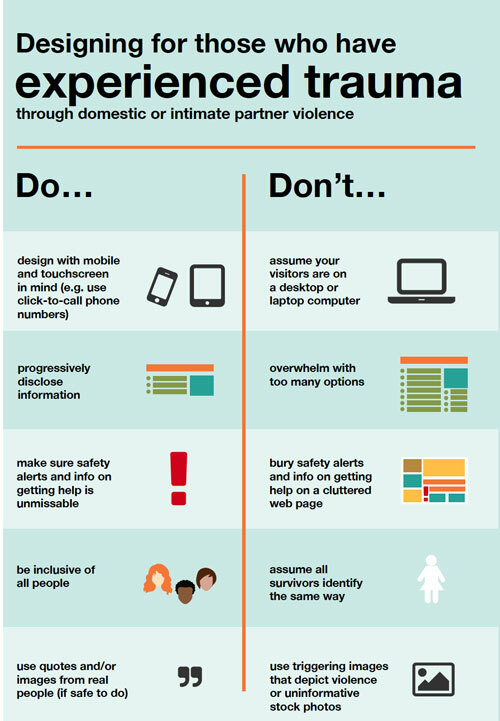 Let's make trauma-informed websites a trend so we can better help survivors!